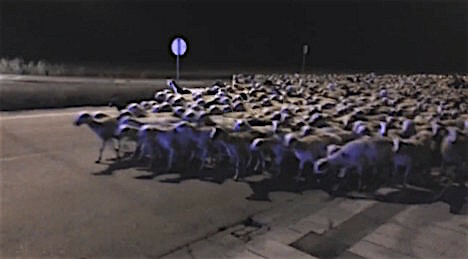 A flock of over 1,000 sheep was spotted roaming through the city centre of Huesca, northeastern Spain on Tuesday after escaping from their shepherd when he fell asleep. Police were alerted to the sizable flock making its way through the centre of the city at around 4.30am when a local resident called the emergency number 112. 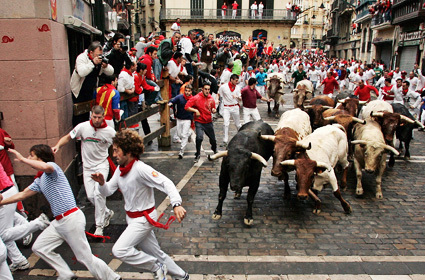 As we wonder of the shepherd was counting his flock when he dozed off, we might recall that this a big day for animals in the street: the start of the annual fiestas of San Fermin are celebrated in Irunea/Pamplona, the centerpiece of which is the well-known “Encierro” (running of the bulls).